SiliConch SCPD3013VIP is a configurable Multiport USB Type-C Power Delivery (PD) Verification IP that is based on the latest USB Power Delivery specification revision 3.0 and USB Type-C Cable and Connector specification revision 1.3. The SCPD3013VIP contains fully configurable PD Stack, Type-C, Policy Manager interfaces, VBUS Power Management and Battery System model to verify real-time scenarios. Integrity checks with protocol checkers along with exhaustive coverage at each layer and CC interface assertions are coupled with environment for easier debug and issue tracing. 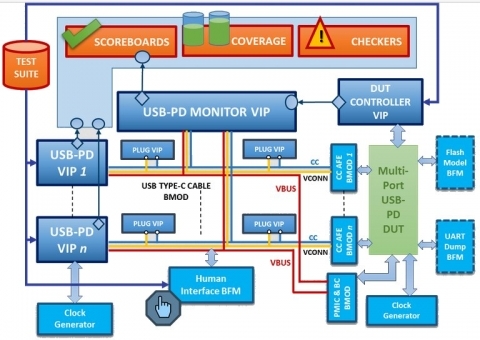 SCPD3013VIP has plug-and-play interface for CC, VBUS and custom interface connections which minimizes the integration effort. SCPD3013VIP supports quick scenario generation for any use-case with minimum effort apart from the extensive test-suite that comes along. Fully compliant with USB PD Specification revision 3.0 and Type-C Cable and Connector specification revision 1.3 including implementations for USB-IF approved ECRs. Supports backward compatibility for USB PD Specification revision 2.0. Supports cable communications (SOP’/SOP”), VDMs (structured and unstructured) and DP Alt Mode. Supports Authentication and Firmware update through PD. Wall charger, Phone, Laptop, Hub and EMC Plug, etc.